In the Portuguese town of Aguas de Moura stands the largest and oldest Cork Oak Tree in the world, according to the Guinness Book of Records. At 334 years old, 52 ft tall and requiring at least 5 people to hug it. The Sobreiro Monumental (monumental oak tree) or the Whistler Cork Oak Tree as it is also named due to the countless birds who have sat on its branches. Apart from her huge contribution to the sustainable cork materials industry she is of huge relevance to the ecosystem, sustainability and fighting climate change. The Sobreiro Monumental (monumental oak tree)The Whistler, Aguas de Moura. 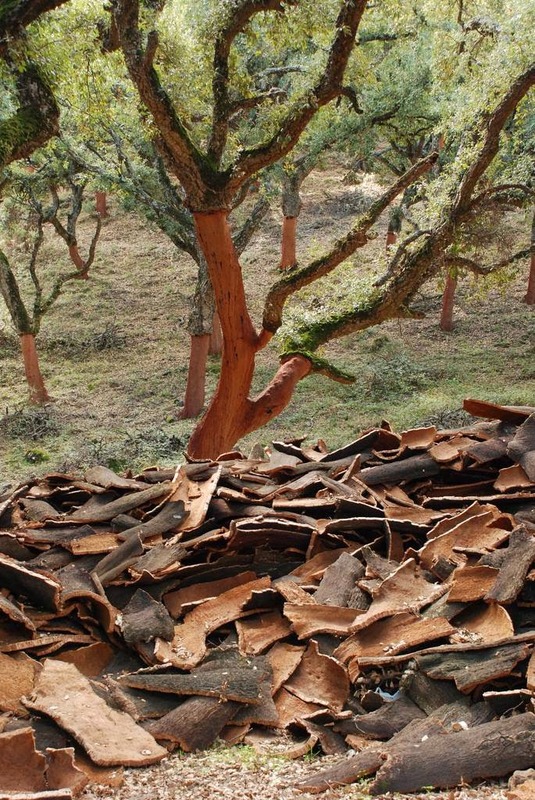 The cork forest called Montados spans over Portugal, Italy, France, Morocco, Tunisia and Algeria, covering 2.1 million hectares with about 340,000 tons of cork being harvested each year, Valuing 1.5 billion Euros to the economy. Of which the Portuguese having the majority share. The Cork Oak Tree produces one of the worlds most incredibly versatile materials, dating back thousands of years to the ancient Egyptian, Greek and Roman times. Cork is the outer bark of the Cork Oak Tree ( Quercus Suber) native to south-western Europe and north-western Africa is mainly produced in Portugal and Spain for the production of wine bottle tops. The only tree who's bark regenerates and is nowadays used to produce a number of products including, architectural products, aerospace and transportation components, construction products, floor tiles, sound acoustic tiles,ceilings, facades, roofs, consumer goods, fashion and furniture. A combination of innovative engineering and cork to create a new Earth re-entry capsule for the European Space Agency will transport soil from Mars to Earth. Protecting and farming cork is extremely beneficial to the environment in numerous ways; Prevents soil degradation, Makes soils more productive, Regulates the water cycle, Fights desertification, Provides retention and storage of carbon for very long periods of time, Regulates the water cycle, Generates high rates of biodiversity, Combats climate change and Creates employment and wealth in the country. Cork farming is for the patient farmer and the tree's can only start to be stripped when it is 25 years old and it takes 43 years until the 3rd stripping until the high quality bark suitable for wine bottle tops is produced. Before this, the virgin cork and any other offcut cork is recycled into the many other cork manufacturing processes. The tree are carefully harvested every 9 years and can typically live up to 200 years + being stripped an average of 17 times over a lifetime. Skilled farmers carefully strip the bark from the base of the trees and the lower branches of the older trees with specially designed tools. The trees are marked so the farmers know when to harvest them only every 9 years.The separated rectangular planks are then carved, stacked and left to weather. The stacks are transported to the processors and stacked for a further 6 months to weather and dry. Each batch is coded and registered so that it can be traced back to its origins for certification. The thick stacks are used for bottle tops and are then stacked flat and boiled to remove impurities and for optimum water content for processing. The stack are then left to rest for a further 3 weeks and then separated into quality categories based on thickness, porosity and appearance. We loved the video below by Amorim Cork Composites, one of the largest cork manufacturers in the world, capturing the trees and the skilled farmers working with them. Amorim's cork composites amazing corporate video shows a glimpse into the complex systems and technology behind the factory processing of cork materials. A perfect balance between nature and technology, we LOVE!